7 oz. The Murph’s Bloody Mary Mix … leave most of the bottle for making Bloody’s, to enjoy while the mussels cook. In a large, deep, heavy bottomed pot with a cover warmed over medium high heat, add oil, garlic, fennel & shallot. Season with salt & pepper. Saute about 2 minutes. Add Sausage and fry till lightly crisp, Arrange mussels in the pan. Pour in vodka and tomatoes and shake the pan to combine. Cook 2 minutes than add “the Murph’s”. 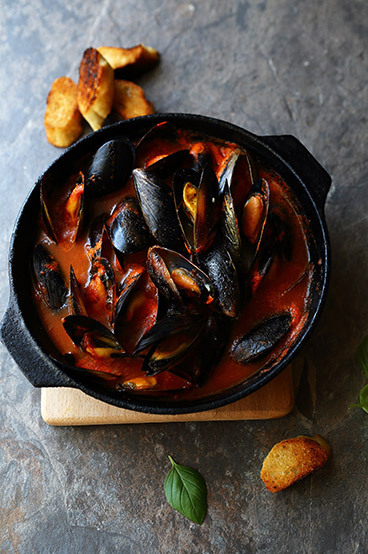 Cover pan and cook 4 minutes or until mussels open. Remove from heat, adjust seasoning and spoon into bowl. Garnish with scallions. Serve immediately with some crusty bread for sopping. © 2019 The Murph's Famous Bloody Mary – Best Bloody Mary Mix.